If you have been RV'ing for any length of time you know that campground power is an ever increasing issue. So what is a surge protector and why do you need one you might ask. An RV Surge Protector is a device that goes between the campground power post and your RV. It can be as simple as just protecting you from power spikes, to as sophisticated as managing the power that comes into your RV, blocking anything that not normal. Many times you will not even know there is a power issue and possible damage occurring to your RV's electronics and electrical system unless you have a monitor or RV surge protector in place. Still confused? Let's look at the problems first and then how you can protective yourself and your RV. Power spikes - Many people would think that lightening was the main cause of power spikes, but it actually is the least common. Unless you where very close to the strike, many of the components used by the utility companies will bleed off most of this energy through grounding systems or component failure. But if you happen to be close enough to the strike the energy produced would create an extremely large power surge which can even overpower a rv surge protector. If you have advance notice, the best tip is to unplug your RV's power cord from the campground power post which will offer total protection from a lightning strike. equipment require a lot of energy to switch on and off components such as compressors and motors. This switching creates a sudden disruption in the flow of electricity, creating a surge that is nowhere near the intensity of a lightning strike, but severe enough to damage electronic and electrical components, immediately or gradually depending on the severity. Other sources of power surges include faulty wiring, problems with the utility company's equipment, and downed power lines. While we where camping in the central portion of Ohio, we experienced a pretty intense thunderstorm, and towards the end of it our power went out. We had been using a RV surge protector and I noticed the RV next to us still seemed to have power. When I checked our connection, we still had power at the campground post, but our surge protector and shut it off to the RV. The display on the surge protector was showing 135 volts (the unit shuts the power off to the RV at 132 volts) which most likely was due to power being knocked out near our location and the campground getting that extra power. Voltage that high is will wreak havoc on sensitiveness electronics such as LED TV's. Low Power - This may have happened to you, your setup enjoying a nice weekend away with your RV's AC keeping things cool. The next thing you know the sky is getting dark and the power starts to flicker. It's not a storm it's the 45' RV that just pulled in next to you and they just cranked up their 3 air conditioners now causing power issues. If you where monitoring the power as those AC units kicked on your voltage could drop below a 100 volts or lower. This is when things like microwaves, dvd players, AC units and TV's are harmed the most. If you have not monitored this in the past you would be suprised how often this actually happens. Many times it's in a campground loop when everyone is running their RV Air Conditioners. This sag in power could continue for a long period of time and is a major cause of RV electronic and electrical component failure. So you may not see an immediate effect, but many times this is the cause of an AC unit failing sooner than it should. 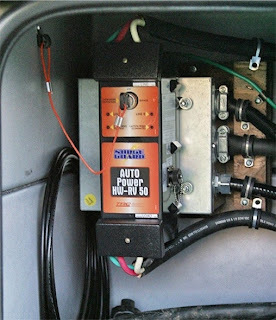 Some of the other hazards just waiting to attack your RV's electrical & electronic systems are mis-wired campground pedestals, reverse polarity, missing grounds, dangerous current and open neutrals to name a few. 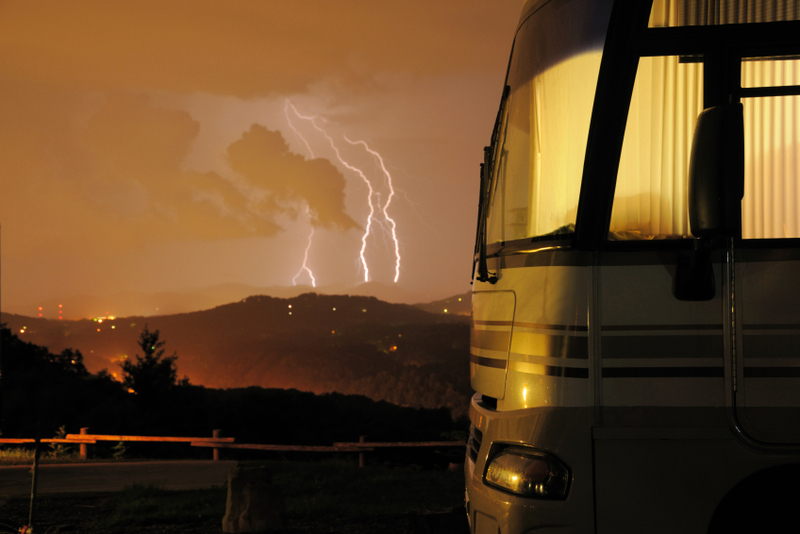 RV Surge Protectors - So how do you protect your RV from this electrical craziness. Well, we have a RV Surge Protection Guide that can make choosing a surge protector a little easier. 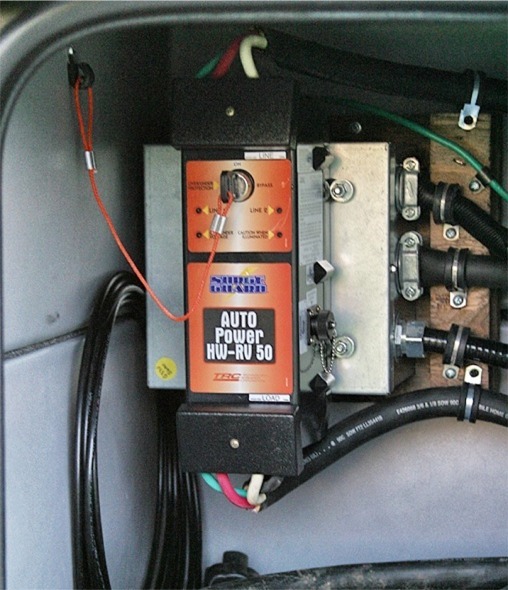 There are currently two manufacturers of RV surge protectors; Surge Guard and Progressive Industries. We have used and tested both companies products and they both work equally as well. There are small feature differences between the two manufacturers and the comparison guide will help in differentiating these differences. You as an RV owner will need to determine how much protection you want your RV to have. 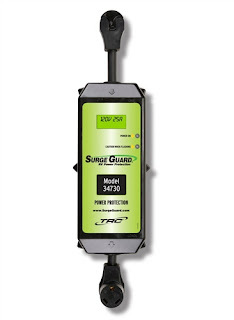 What you will find in the world of RV surge protection is that there are 30 & 50 amp portable and hardwired units to choose from. If you really hate dealing with electricity then a portable unit is designed just for you. Plug the unit into the campground power post, plug your RV's power plug into the unit and your up and running. Looking for a more custom installation? 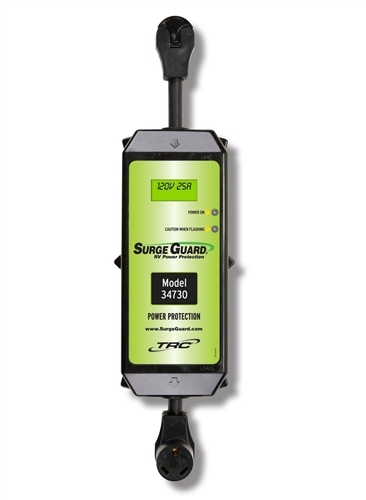 The Surge Guard and Progressive hardwired surge protection units are designed for you. Generally mounted in an electrical bay some of the units even have additional monitors to read what the electrical power is doing from inside as well as outside your RV.